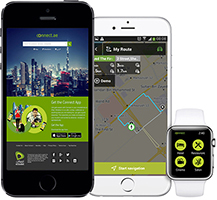 Etisalat Information Services (eIS), previously known as Etisalat Directory Services, is the leading directory services provider in the United Arab Emirates since the publication of its first directory in 1976. Etisalat Information Services maintains UAE consumers' directory listing database, which is used by Directory Enquiries (181). It also publishes annual telephone directories for residential and commercial usage through print, online and mobile. To be the first choice of eCommerce aggregators in the region. To provide reliable, up-to-date, innovative and user friendly eCommerce platform across all channels in the UAE and beyond. Official Etisalat Yellowpages - Free Online Business Directory in UAE. The Etisalat Yellowpages business directory is an online marketplace that helps you list as well as find; exporters, importers, service providers etc. This UAE business directory is a single place to get multiple benefits. 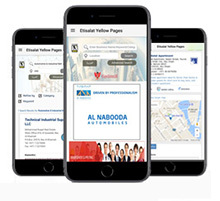 The benefit of listing your business/company on the official Etisalat Yellowpages is that it will increase traffic on to your website and also help in the overall ranking of your site in the online search engines. The second most important benefit of the same is that the business leads you acquire from the business directory will turn into sales leads. For easy access and easy search The Etisalat Yellow Pages is resourceful and helps you stay current with the latest information you need! Get instant and easy access to business addresses, phone numbers, fax numbers, websites, emails and ads. Connect.ae is your tool to search for your favorite destinations ‎either for business or pleasure offering routing guidance as well as many value-added services for the search results. Whether it is a cafe, a shop, craftsmen or anything else you are looking for, you get a quick response. The searches you make are based on your location and sorted by distance, reviews or alphabetically. Also available for Apple Watch.